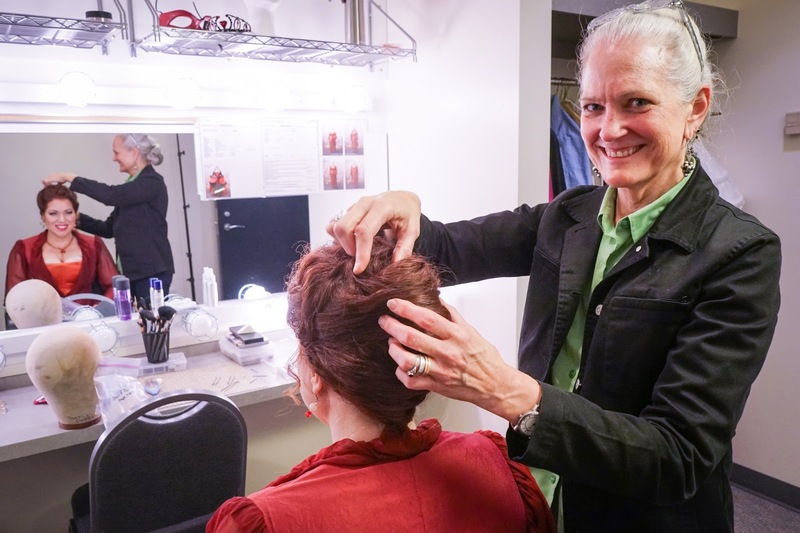 Joyce Degenfelder, Seattle Opera’s Hair and Makeup Designer, has created wigs for nearly every Seattle theater company under the sun—from PNB to Seattle Children’s Theater, Intiman, ACT, and Seattle Repertory Theater, where she is on staff. At Seattle Opera, she has created signature coifs for a wide range of characters. Consider the crazed villains in The Tales of Hoffmann, the foreboding up-do of The Consul’s Secretary, Turandot’s long red-ribboned tresses, and the near-bald pate of Elektra’s mother Klytämnestra (which still gives me nightmares). Joyce has worked for Seattle Opera since Parsifal in 2003, and while she is most comfortable backstage, she has recently been front and center of Seattle’s arts scene, as recipient of the Gregory A. Falls Sustained Achievement Award, given by Theatre Puget Sound. It is a recognition much deserved. I met Joyce at her studio at the Seattle Rep. On three shelves were more than a dozen wigs on wig blocks (think mannequin heads), each tagged with a character’s name, in various states of creation. (The wig for Judge Smith in the Rep’s All the Way was still in curlers, which would eventually be combed, styled, and sprayed into his signature wave.) She invited me to sit in her swivel chair in front of her mirror, while she pulled a head off the shelf to demonstrate the process of "hand-tying" a wig. She poked a hook through the netting under the wig, pulled a single piece of hair through and knotted it. Then repeated. Yes, folks. When Joyce hand-ties a wig, she makes it one hair at a time. Sometimes it’s human hair. Sometimes synthetic. And sometimes—though more rarely these days because of the cost—yak hair, prized for wigs because it’s thick, white, and easily dyed. The choristers in Don Giovanni’s party scene had a yak with a buzzcut to thank for their blue and pink Restoration period hair. In Ariadne the only yak wig is the one the Tenor refuses to wear in the Prologue. Many of the wigs in Ariadne are in her inventory, but she’ll hand-tie a new wig for the Composer, and the Prima Donna will have a head of wild curls. The “looks” will range from neoclassical Grecian braids to bold, exaggerated commedia dell’arte. The period pieces—her bread and butter—are what got her interested in wig making in the first place. She enjoys the research, finding the right silhouette. “It’s fun to create that world,” she says. And if you’re wondering whether it’s ever the singer’s real hair up there, the answer is almost always no. “Usually the moment they start singing and get warm, a curl is going to start drooping out and the hair just goes limp,” Joyce says. And the wig saves the crew time. It takes eight minutes to pin up and wig a singer, an additional half hour if a singer’s hair needs to be styled on the spot. Joyce also loves the collaborative process between the director, costume designer, wig and makeup designer, and the singers. Most singers want the hair away from their ears. And inhaling a wisp could be disastrous. With new productions, she gets to bring the costume designer’s vision to reality. With Semele, for instance, the gods wore costumes with long and flowing lines, and the humans wore angles and geometric shapes. The wigs were a perfect extension of this design. Plus Joyce got to create Pasithea’s fabulous blue beehive. She likes that wig making is still a hand-crafted product, though the bar keeps getting raised. “The pressures of media and movies has made us go to finer materials and more natural looking styling onstage.” All those close-up marketing shots? Simulcasts? The singers need to look natural under an HD camera’s scrutiny. Her main goal is to make the singer feel good. “I try to put the project together in a way that makes people happy onstage. They’re the one out there singing, not me,” she says. This Staff Chat first appeared in Seattle Opera’s program for Ariadne auf Naxos in May 2015. She enjoys that wig making is still a hand created item, however the bar continues getting raised. The weights of media and films has made us go to better materials and more common looking styling in front of an audience. We are talking about hair and makeup designers with the staff. The besttermpaper are used the hair and makeup services from this website. So that, I am very happy about your makeup and hair designs. In people with sound follicles around 90% of the hair on the scalp develops at one time. Since by far most of follicles are in the Anagen stage and just a little rate of them are in the Tologen stage a typical measure of hair drop out isn't discernible.